How do I recover deleted videos from Sony Handycam? I have a Sony Camcorder, and there are a bundle of HD movie clips on it. I deleted one mistakenly right now. Am I able to restore it? If you accidentally deleted files from camcorders/cameras, first thing to do is: do NOT use the digital camcorders/cameras to take more recordings, NOR should you try to put new data into the memory card or hard drive of your camcorder. This is because that new data could overwrite the space of deleted files, wich will make deleted files unrecoverable. 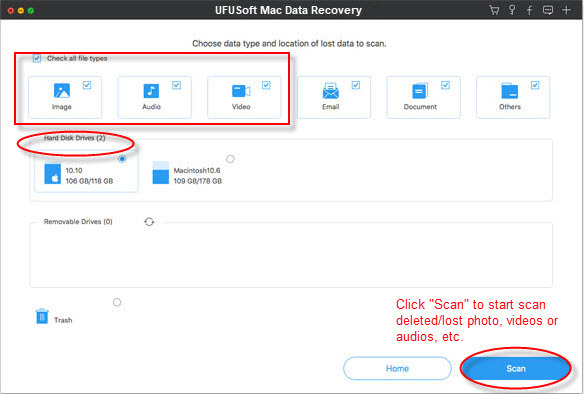 Then use UFUSoft Photo Recovery for Mac as the best Camcorders/Cameras Recovery software to help you recover deleted or lost videos or photos from Sony camcorders/cameras. It also can restore all lost or formatted photos, videos, audios from hardware malfunction or your memory card. The recoverying software works great with all your Sony HanyCam camcorders, Sony Alpha Cameras or Sony Cyber-shot_cameras like Sony HXR-NX30, Sony Cyber-shot HX50V, Sony HDR-CX220, Sony HDR-CX380, Sony HXR-NX5U, Sony NEX-FS700U, Sony HXR-MC2000U, Sony HDR-PJ380, HDR-FX1000/HVR-Z5,Sony HDR-TD10,Sony HDR-TD20V,Sony HDR-TD30V,Sony HXR-NX5,Sony HXR-MC50E,Sony DCR-VX1000, Sony DCR-VX2000, Sony DSR-PD150,Sony HDR-HC7,Sony HDR-FX1,Sony HDR-FX7,Sony HDR-SR1/HDR-SR5/HDR-SR7,Sony HDR-CX7,Sony HDR-CX12,Sony HDR-CX500V,Sony HVR-Z1,Sony HVR-Z5,Sony HVR-Z7/HVR-S270, etc; Sony Alpha series like Sony NEX-FS100. NEX-VG20, Sony Alpha NEX-5, Sony NEX-VG10, Sony NEX-5N, Sony NEX-7, etc; Sony Cyber-shot DSC-WX80, Sony DSC-RX100, DSC-WX50, DSC-WX70, DSC-WX150, DSC-WX200, DSC-WX300, etc. 1. Connect your Sony camcorders/cameras to computer with USB cable or connect the memory stick with a card reader. 2. Download demo version of Sony camcorders/cameras video/photo recovery and install it on your Mac or PC. 3. Run the software and click on “Recover Photo, Audio & Video” to continue. 4. Select the drive that presents your Sony camcorders/cameras and click “Start Scan”. 5. After scanning, you can preview the found videos/photos. Select the video/photo files that you want and then click “Recover” to recover deleted/formatted videos/photos from Sony camcorders/cameras. Motorola Data Recovery-How to Recover Deleted Data from Motorola Phone?